This article is part of our week-long celebration of Fallout’s 20th anniversary. Make sure you check back throughout the week for more features. At the beginning of Fallout: New Vegas, a character named Benny shoots you in the head before scurrying off with the valuable item you were carrying. Handily, you are revived pretty quickly, but soon learn you have no idea where Benny has gone. The only direction you are pointed is toward the vast Wasteland. You amble south for a while, away from New Vegas, before new information sends you east, and then north. In need of a companion? Here are the best Fallout followers. This initial journey gently encourages you to explore other locations between your destinations. An old racetrack, a drive-in cinema, and a skydiving centre all line your route south. These first spots are mostly window-dressing – there are no quests attached to them, and only a handful of low-level enemies cluster around them. But they introduce you to the idea of stepping off the beaten track, swapping the point-to-point progression of a central narrative for a more gradual exploratory affair. If you do follow the main story, then the first few hours of the game send you on a gentle curve across the map’s south-west corner, through the towns of Primm, Nipton, and Novac. After you reach the latter, however, Benny’s trail more or less runs dry. All you know is that he is holed up in New Vegas, and that New Vegas is a very long way away. The entire Mojave Desert seems to stretch away in front of you. It is a daunting sight, especially if you have played a Fallout game before, and know that desert will be filled with as much as danger as it is opportunity. 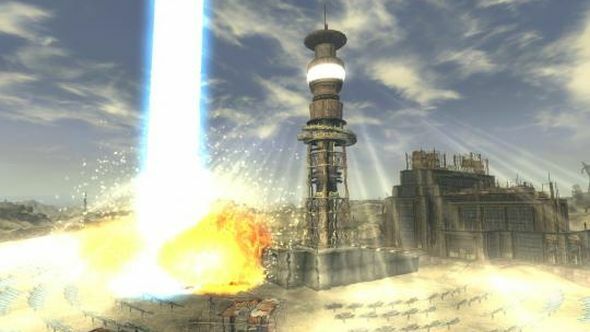 For a long time, Fallout: New Vegas’s main quest abandons any sense of linearity, leaving you entirely to your own devices as you meander across the Wasteland. As always, your primary aim is to get from point A to point B, but not only are you without pressure to complete the main quest, you are almost actively discouraged from doing so. The roadside curiousities found in the first few hours encourage you to go in search of more, and the way is littered with caves, vaults, and hideouts. Some of them can be dealt with easily, as you can happily dispatch the few escaped prisoners and angry radscorpions that dwell within. Others you may have to return to later on. One of my most vivid memories of the game is cowering in fear, desperately under-levelled, trapped in the middle of a Deathclaw camp. Sure, you can make a beeline up the road towards New Vegas, but I zig-zagged back and forth across the Mojave for hours before I eventually saw the skyscrapers of the Vegas strip on the horizon. This is the way Obsidian clearly meant for it to be played. It is why they hold your hand for those first few hours and then, abruptly, let it go. Bethesda never really had the gall to pull off a similar move in their games in the series. On my way north, I joined a crippled chapter of the Brotherhood of Steel, vilified and driven underground. I helped secure a military-occupied solar power plant, helping maintain power across the Mojave. I brawled with Super Mutants atop a mountain, and fired a rocket full of ghouls off to their very own promised land. Those encounters, and dozens more, enrich the world that Fallout: New Vegas has to offer. 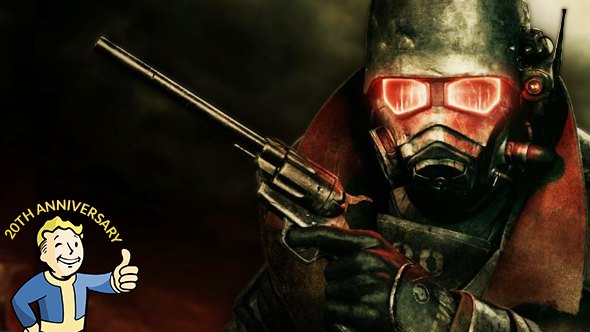 It comes to define the differences between Obsidian’s take on the series and Bethesda’s: New Vegas has less narrative focus than Fallout 3 and 4; instead of searching for a loved one or trying to save the Wasteland, you are pointed in a direction and told to go out and make your own stories. Obsidian want you to more freely meander from one wild encounter to the next across their savage playground. That is not to say Bethesda’s offerings do not allow you to explore. But it does feel as if there is no escaping the central narrative thread – in those games, everything I did felt like a means to get closer to my eventual goal. The furthest afield I ever went in Fallout 3 was to gather up money I needed to progress the main quest. Towards the game’s climax, when the narrative transported me to the far corner of the Wasteland, the sense of urgency instilled by the story encouraged me to fast-travel straight back to the action. Fallout: New Vegas, on the other hand, wants you to get tangled up in other stories, to see where each loose thread leads, and to make your own. In the end, I scoured nearly every corner of the Mojave, but were it not for the game’s open-ended nature, I probably would have barely scratched the surface. How did Fallout 1 ever get made?